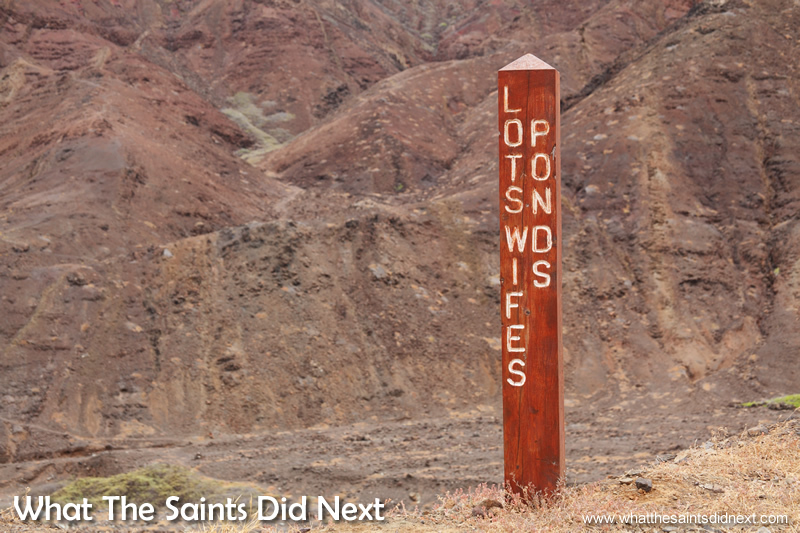 Hiking on St Helena – Start of the trail for Lot’s Wife’s Ponds post box. We almost cancelled the walk to Lot’s Wife’s Ponds because of the rain. It didn’t look good as we drove through the Sandy Bay district, shrouded in fog. Fern, bamboo and banana trees were dripping wet. We dropped altitude below cloud cover to magically find the beach area clear and dry with patches of blue sky. This looked promising; it was like another world compared to the rest of the island. There were six of us. 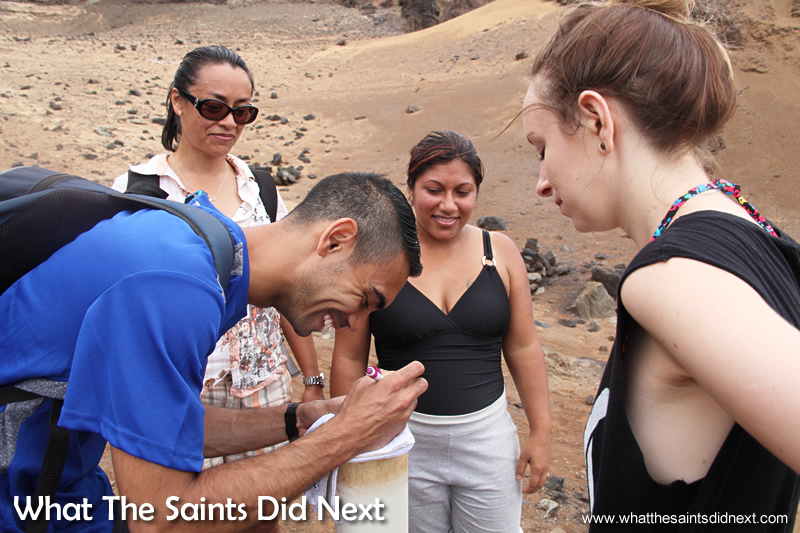 What The Saints Did Next were tour guides for Post Box newbies; Leroy and Kayla, locals determined to explore their island and Robin and Karen on a short visit from the UK cramming in as many activities as they could. They jumped out the car full of enthusiasm for their first Post Box walk. Laces tightened and back packs strapped on, we made our way to the Ponds, a walk the Nature Conservation Group rates as 6/10 for effort and 8/10 for the terrain. An engraved wooden stake marked the start and plenty of wooden arrows and stone cairns along the route ensured we didn’t wander off the path. The first 20 minutes took a little exertion as we zigzagged up and away from the beach area. The stark contrast of Sandy Bay’s landscape was quite amazing, from the densely foliaged highland to the parched coastal lowland. We clambered over volcanic terrain full of colours and rock formations you might expect to see on Mars, paying careful attention not to trip or twist ankles. Hiking on St Helena, Lot’s Wife’s Ponds. 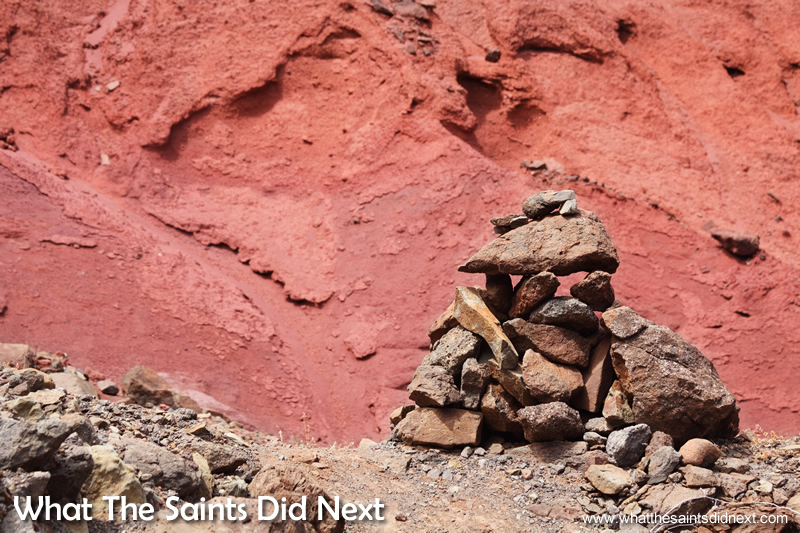 A stone marker cairn near the amazing red earth at the start of the hill climb. 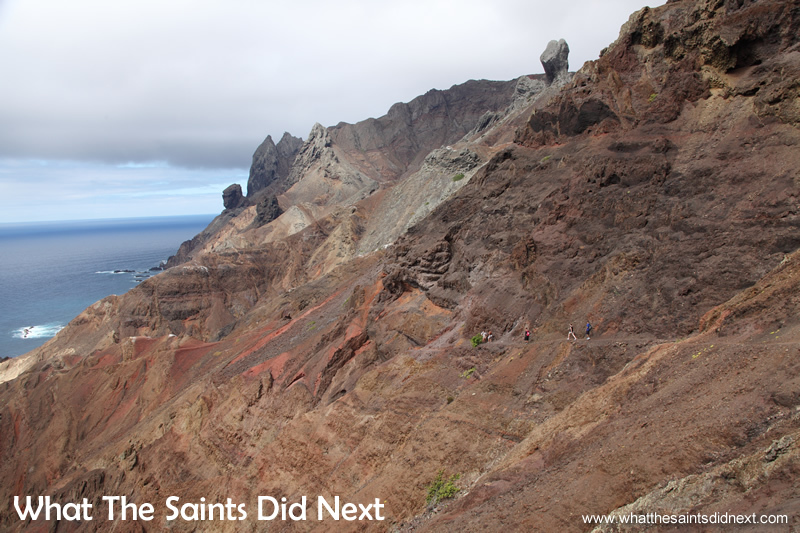 Hiking on St Helena. Truly dramatic terrain on the Lot’s Wife’s Ponds walk. ‘Babies Toes’ growing along the pathway to Lot’s Wife’s Ponds. Hiking on St Helena, Lot’s Wife’s Ponds. 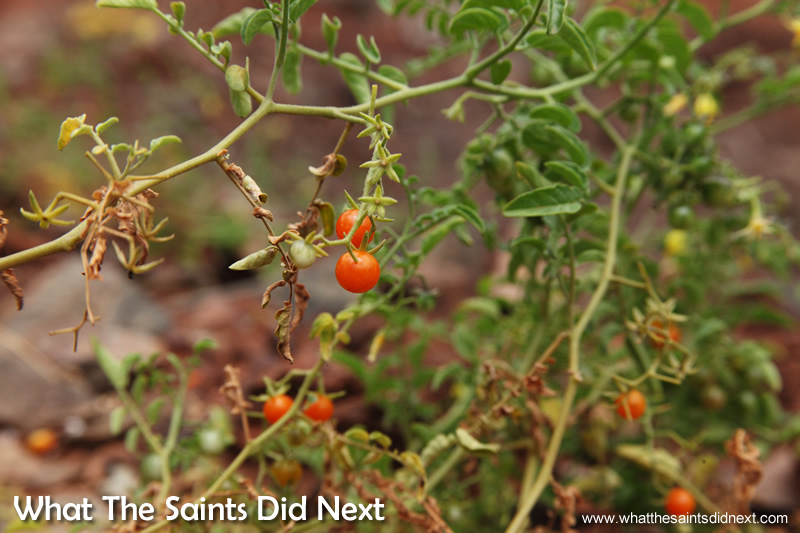 A surprise, wild tomato bushes found on one part of the walk. 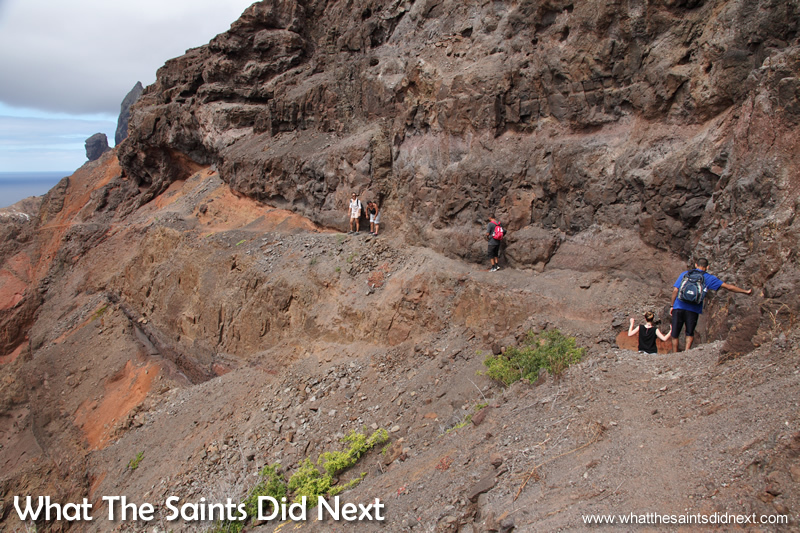 Hiking on St Helena, Lot’s Wife’s Ponds. The highest point on the walk at 210m above sea level has great views of Gorilla’s Head and Asses Ears. 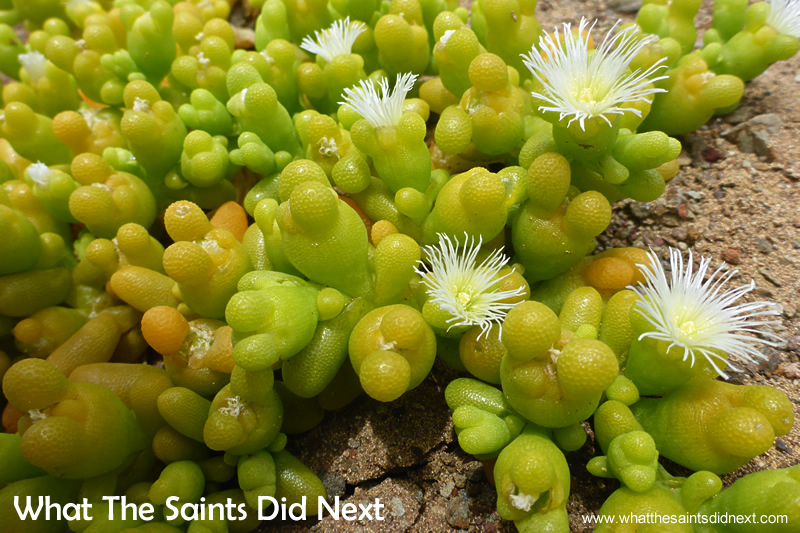 Growing along the way are chubby ‘babies toes,’ a succulent endemic plant resembling their namesake. The small lime green toes are stubbed with white daisy-like flowers, very pretty on the stony ground. As we reached the top of the path a little sweaty and red faced, Lot’s Wife column, Asses Ears and Gorilla’s Head (likeness is uncanny) came into view. Enjoying the gentle breeze at that point we stopped for water and admired the scenery. We pushed further on and the trail gradually sloped down along a cliff face toward a plateau displaying rock graffiti; ‘FIZZLES ME’ (with an arrow pointing left) and ‘LOTS WIFES PONDS’ with an arrow pointing right. We had no idea where Fizzles Me would lead, but to the Ponds we were headed. Near the puzzling sign and just off the path we saw a masked booby seabird incubating a speckled egg. There are multiple nests scattered along the jagged edges of the remote hillsides. Throughout the walk we caught distinctive whiffs of pungent stale guano and could hear the birds’ resonant quacking. The path winds around the rocky hillside (spot the people). Lot’s Wife itself can be seen at the top. Hiking on St Helena, Lot’s Wife’s Ponds. 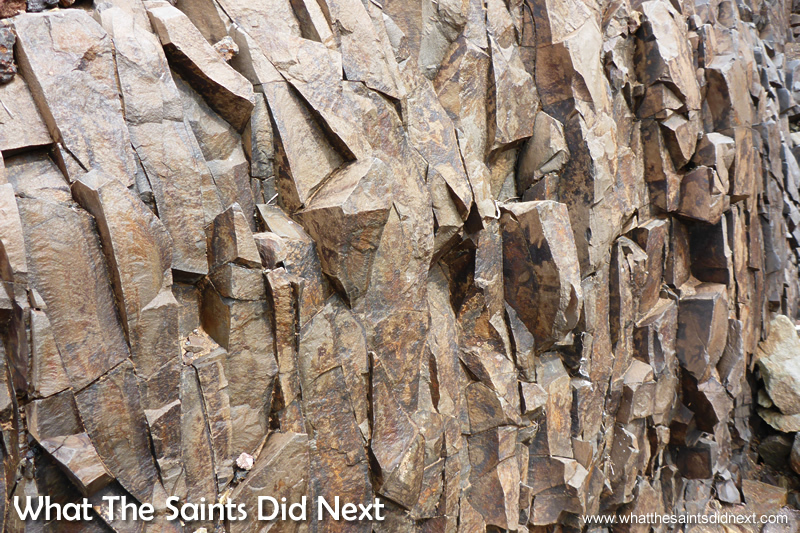 Some of the rock formations along the way are just stunning. 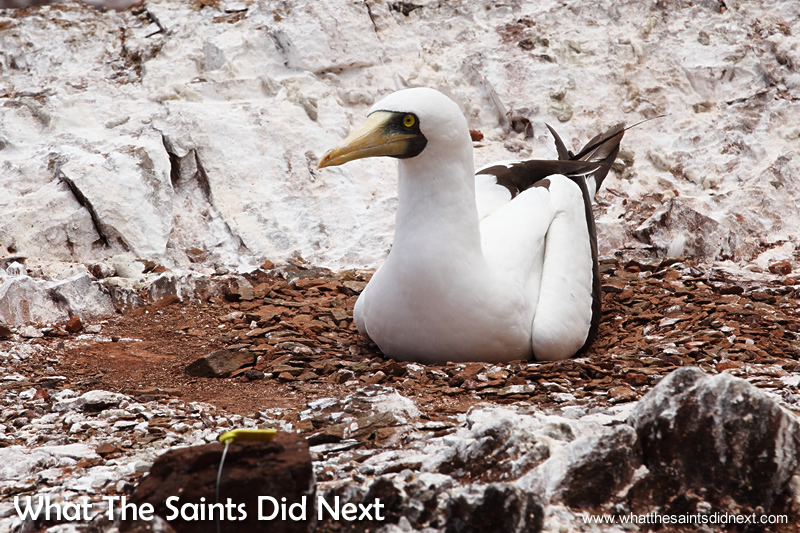 A lone masked booby nesting near the path keeps its egg hidden. We headed in the direction of the ‘right’ arrow, negotiating small scree sections and came upon white sandy patches, seemingly dumped inland by helicopter, such is the distance it’s located up on the hillside. 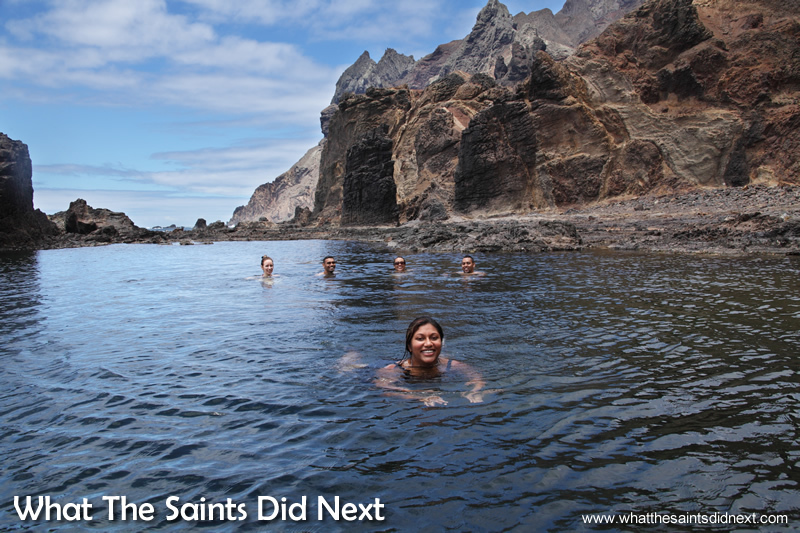 White sand is a novelty on St Helena as the few coastal beaches we have contain black sand. This is the only place you’ll find the gleaming stuff. If only we could transport it around the coast to Sandy Bay beach! At this point the rock ponds of Lot’s Wife came into view below, so we picked up the pace and hurried to the plastic pipe Post Box, sticking out of the ground that held the walk comments book and ink stamp. It had taken 1 hour and 30 minutes to get there. We stamped our arms, took selfies and prepared for the final 30m descent to sea level, beckoned by the alluring Ponds below. Leaving a message in the Post Box visitors’ book. 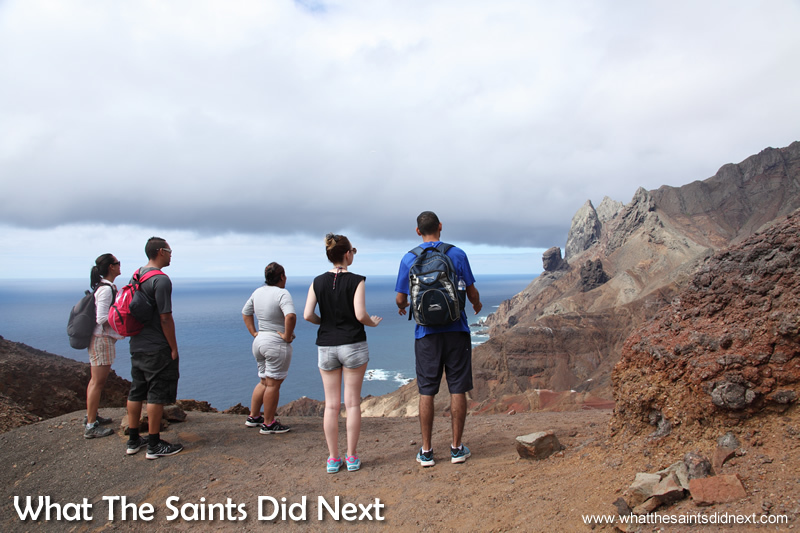 Note the white sand in the background, a rarity on St Helena. Hiking on St Helena, Lot’s Wife’s Ponds. One stamp each. 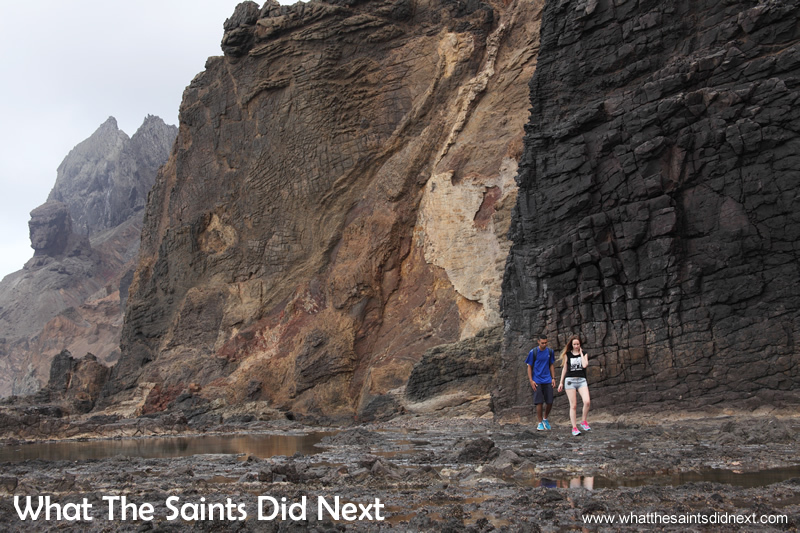 Hiking on St Helena, Lot’s Wife’s Ponds. The final descent using the rope for support. Walking across the flats that are the Ponds. Up to this point the walk was not difficult; a reasonable level of fitness was required with a generous helping of sure-footedness. But the last bit was tricky and involved a little backward shuffling down a steep rock face holding onto a secured length of thick rope. Easy peasy if you don’t look down! But, once you’re down you won’t regret it. We stepped onto a pebbled beach, a tall funnel-shaped stack towered over us and we marvelled at the absolute beauty of the Ponds. Small bodies of sea water trapped in bowls of rock, some deep, most shallow, reflected the brightening sky. It looked strikingly like a natural infinity pool of sorts. A low rock wall is the only protection from the choppy ocean on the other side where occasional waves came lapping over to refresh the Ponds. Playful five finger (pilot) fish darted about, mean-looking crabs scurried for cover and spiky sea urchins stood their ground. 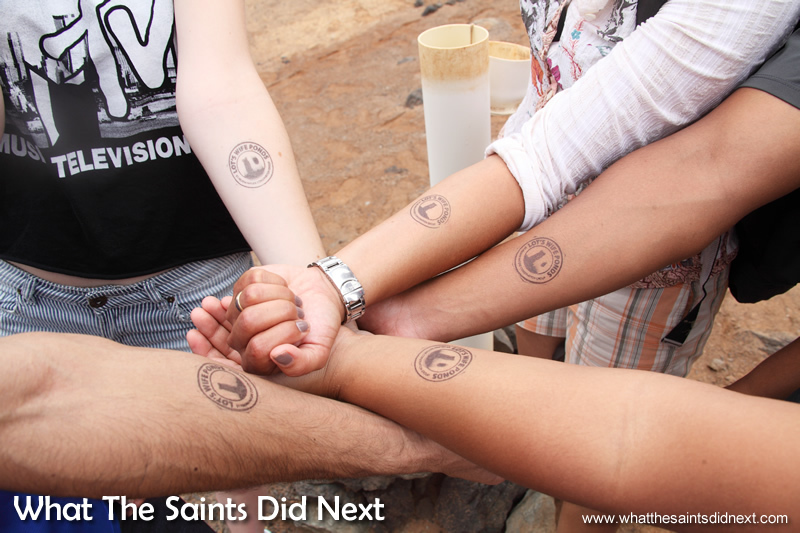 We couldn’t wait to get in. A wonderful reward, cooling off in the Ponds. Testing out the underwater camera. The salt content in the Ponds is high making floating a doddle. 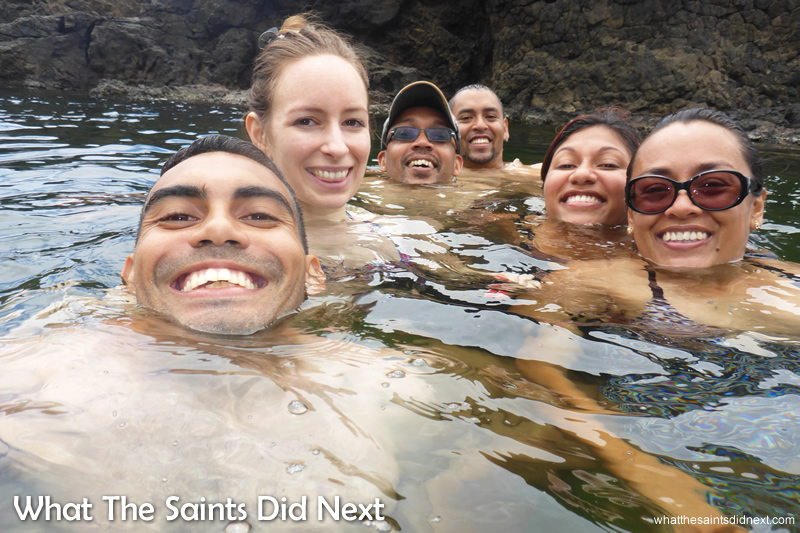 A six person selfie while treading water – not as easy as it looks! The rock surface underwater was mossy and quite slippery; the cool water initially drew sharp intakes of breath as we eased ourselves in and stretched out in one of the largest Ponds. Some of us kept our shoes on as protection from sea urchins and jagged edges. 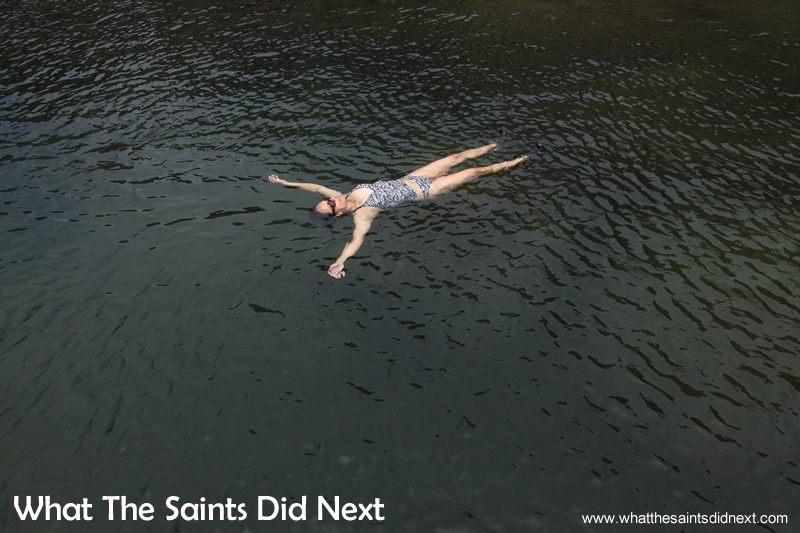 Swimming didn’t require much effort as the high salt content gave us incredible buoyancy. We frolicked about like children, scattering small sea creatures to the safe confines of rocky recesses. The Pond was quite deep in places requiring well executed duck dives to touch the bottom. This was the first time for us to test our brand new Panasonic underwater camera. Either it would work and we’d get some brilliant shots, or not, and we’d lose all the images of the walk. A bit timid and not totally reassured by the thin rubber seal we took the ‘plunge’ and submerged it. Underwater testing was a lot of fun! We reluctantly got out after an hour, totally sated, to dry off in the mild sun and to replenish energy levels with chocolate biscuits, fruit and Twiglets. Then with squelching wet shoes we pulled ourselves up over the rock face and made the return journey in 1 hour 20 minutes, just as dark grey clouds started to gather. Hiking on St Helena, Lot’s Wife’s Ponds. Beginning the long walk back. Note the chimney stack which is near the climbing rope. The cloudy weather started rolling in on the way back. 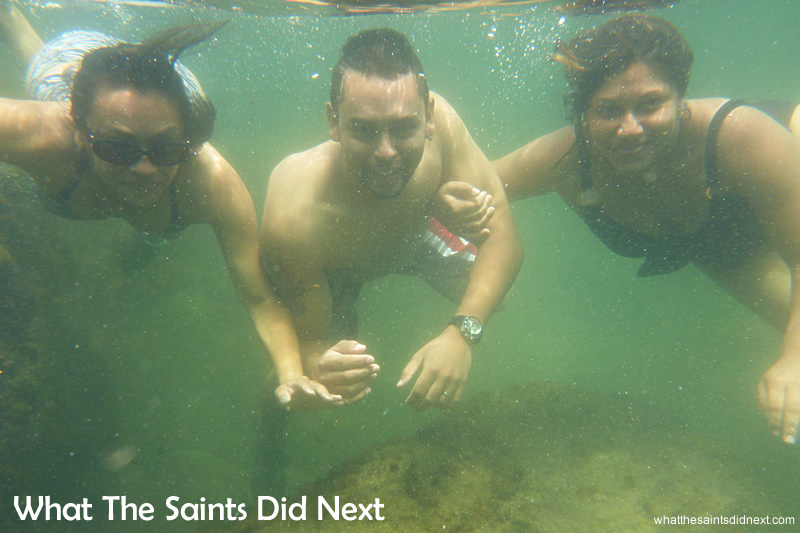 Swimming in the Ponds was a serene and blissful experience and we were truly taken with Lot’s Wife’s Ponds. The spot is pristine and unspoilt, perhaps because of its remote location. 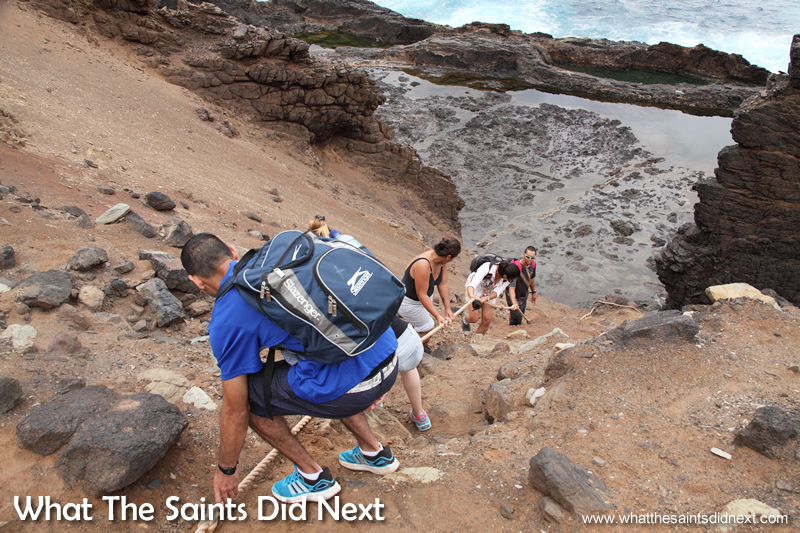 Although it is a relatively easy hike for competent walkers it is not easily accessible to all. Which is a bit of a shame, but then again maybe this is a good thing. Disclaimer: The information in this article is not intended as to validate the safety or otherwise of the walk route. 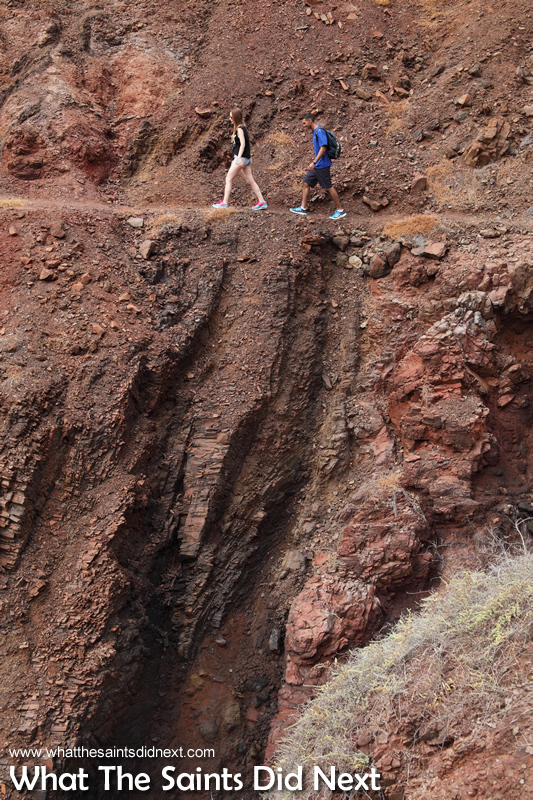 Trails on St Helena are subject to change depending on weather conditions, plant growth and natural erosion. 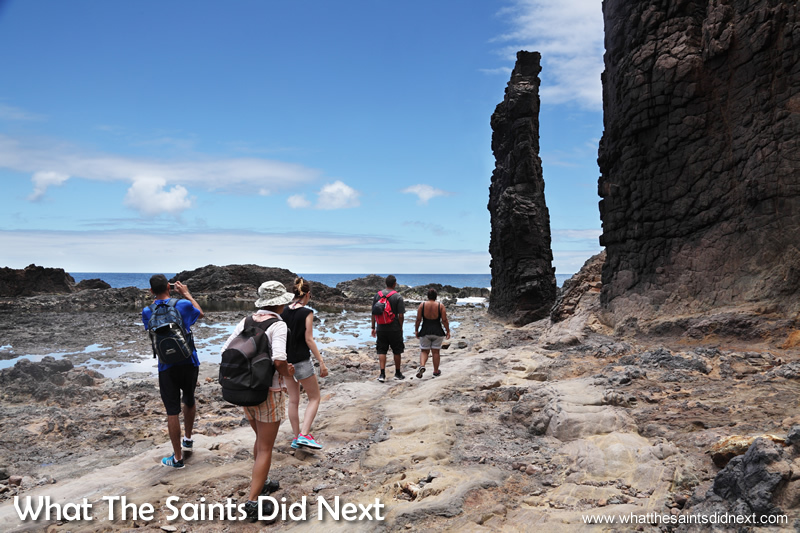 Walkers unfamiliar with the walks on St Helena should seek the assistance of a competent local guide. Twice, like mountain goats, a group of us scrambled along the heights, the crevices, the barely trodden paths and down to the ponds – no ropes in place those days. On the second trip I thought my life had come to an end when I slipped….saved by Alan Hoole, from tumbling to God knows where! Some spectacular rock formations/volcanic dykes along the way and the ponds are just amazing examples of nature in so many forms. Beautiful photographic illustrations and write-ups, thanks for sharing! Loved the photos, captured the splendid views as always guys! It’s a really nice walk, bot really too strenuous and so worth overcoming a fear of heights to descend the rope scramble for a swim in the pools! Love Gorilla’s Head, looks like King Kong. Great photos. 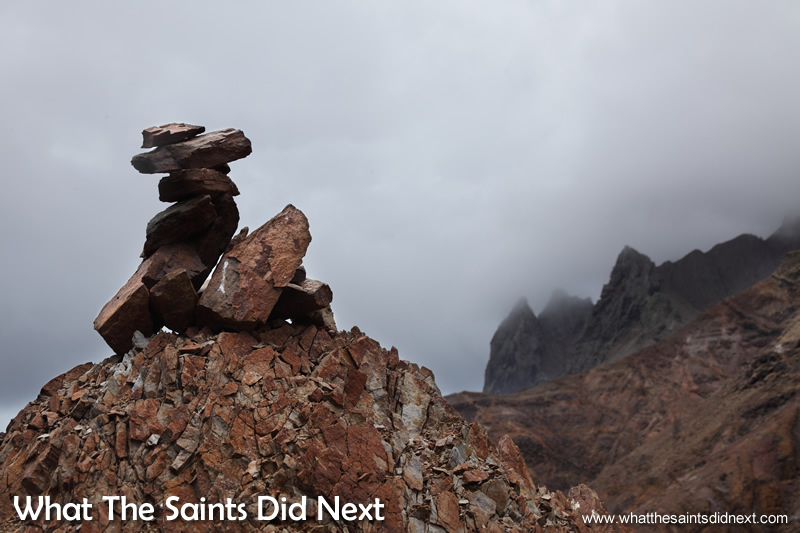 I walked from my sister’s house in 2004 to the ponds at 5am and built an Inukshuk (an Inuit term meaning “someone was here” or “you are on the right path”) with those piles of rock that still remain in one of these pictures, not the one in the picture, but that’s ok too! Love lots wife ponds, a place of solitude. Wow if only we’d chanced to have taken a photo of your ‘Inukshuk’ ! We love Lot’s Wife’s Ponds too – an awesome spot to chill out. Is the only words i can say to these amazing pictures !!!!!!! This takes me back to the many times we have done this hike and never tired of it. St Hekena has many beautiful hikes. An excellent article, I am hooked on your excellent coverage of Island activities.